So how’s this multi-mode digital stuff work? Traditional digital repeaters do one mode at a time. DMR repeaters only support DMR radios, DSTAR repeaters support DSTAR radios, and Yaesu System Fusion (YSF) repeaters only support Yaesu radios. Each of these digital modes are incompatible with each other on the air, and to make it worse all three of these modes have their own separate online networking/linking systems. There are some options to bridge these separate modes inside the reflectors so they can communicate with each other, but the repeaters are still one mode at a time. This posting is not intended to explain how all these modes work. That explanation could take days, and you should do Internet searches to learn what you need to about modes you may use. A multi-mode digital repeater can support all of these modes one at a time, and also NXDN and P25 if enabled on the repeater. The Wayne Technical Fanatics repeaters are all using Raspberry Pi controllers with Scott Zimmerman N3XCC’s excellent ST32-DVM digital modem and Andy Taylor MW0MWZ’s fantastic Pi-Star software. They are essentially the same as a Pi-Star hotspot that you might have at home, only these are setup to run full duplex with “real” radios or repeater hardware into more robust antennas. This setup allows the repeater to automatically detect which digital mode the user is using, and repeat it. The repeater can also connect the repeater to Internet based network for that system, so you can use talkgroups, reflectors, or rooms to communicate with users on other remote repeaters around the world. Multi-mode digital repeaters allow hams to use whichever digital mode radio they have, and if the radio is setup correctly you won’t hear noise from the other digital modes that may be on the air. However, there are some nuances and compromises involved in a multi-mode digital repeater. This post will help guide you through some of those. Also note that (at the moment) analog FM is not supported at all on these repeaters. The only analog FM you’ll hear is the CW ID from the repeater. 4Z1UG’s QSO Today Podcast Episode 230 interviewed Jonathan Naylor G4KLX, who is the inventor of the MMDVM modem that is at the heart of our multimode repeater. It’s worth a listen if you’d like to learn more about how it works and some of the history. Since the repeater can only do one mode at a time, you may see a signal on your S-Meter or see the activity light on your radio on, but not be able to hear any audio. For example, if you have a DMR radio and see the activity light on but hear no audio, someone may be using the repeater for DSTAR. With DMR, you may even try to key up, and get a “repeater not available” message back on your radio. You will have to wait until they are done before using the repeater for DMR. The repeater also has the CW ID enabled which will key up the repeater for about 5 seconds every 10 minutes and send a CW ID over FM. This is required because DMR specifically does not send a callsign in the data stream, so the CW ID is required for ham repeaters operating in this mode. 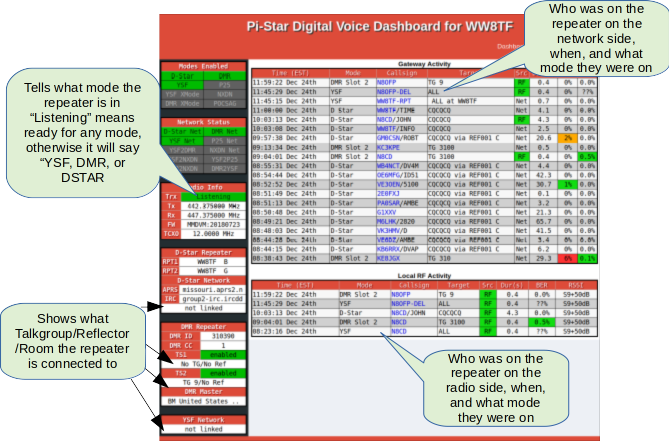 DSTAR and YSF modes do send the repeater call in the data and do not require a CW ID, but we never know when the repeater will be used for DMR. If you listen to the repeater frequency in analog FM mode, you will hear this CW ID. The repeater chooses its mode based based on the last mode it sees either on the radio or the network side. There is also a 1 minute timer that will lock the repeater in that last-heard that mode. For example – if you key up the repeater on DMR on TAC310, the repeater will stay in DMR mode until 1 minute after the last DMR signal comes in either from the network or from the radio. What Mode Is the Repeater Is In? When you see or hear a signal from the repeater but you don’t know which mode it is, there’s at least 3 ways you can tell which mode you’re hearing. Turn on another radio with a different mode and try it. With some practice, you can listen and hear the different modes by ear with your radio in FM mode. There are distinctive noises at the beginning and end of each transmission you can hear by ear. Check the repeater dashboard at https://ww8tf.ww8tf.club for 442.375, or https://ke8ldg.ww8tf.club for 442.7375, or https://ke8ldh.ww8tf.club for 442.5125. DSTAR and YSF modes do not have time slots, but DMR does. When the repeater is in DMR mode, it can have two simultaneous users doing totally different DMR things on the repeater (one in each time slot). But when the repeater is in YSF or DSTAR mode, only one user can be on the system at a time. If the repeater is in DMR mode and only one slot is in use, it is still in DMR-Only mode. You cannot have DSTAR or YSF in the “other time slot” because DSTAR and YSF do not have a notion of other time slots. One mode at a time. Waiting for user input to select one of the above modes. Listen first: Listen for a moment and note if there’s any activity on the channel before you use the repeater. This is good advice for any mode, not just digital. If you’re close to a computer or smartphone, you can also check the repeater dashboard to see what is happening on the repeater in real time. Links are above. Be patient: These repeaters generally aren’t that busy, but if you see a signal and don’t hear audio, do not key up your radio. You may not be able to hear audio, but your digital signal could interfere with another user. Remember to check the dashboard if you can. Key up briefly in the digital mode of your choice: Once you see the repeater isn’t in use on your S-Meter or activity light for a bit, you should key up briefly in your mode of choice. This is the digital equivalent of “plunking the repeater”. In all 3 digital modes, the repeater will come up briefly when you key it. This will make sure the repeater is switched into your mode before you make a call or connect to a talkgroup/reflector/room. Lock your digital radio in the digital mode on these repeaters: Yaesu and some DSTAR radios have the ability to automatically switch between their digital mode and analog. What this actually means is if the radio detects a digital mode it understands, it’ll decode it. Everything else it hears is considered FM and will be played out on the speaker. If a Yaesu radio has AMS (Automatic Mode Select) or Icom radio has Auto-Mode enabled on one of our frequencies, you’ll hear loud digital noises when one of the other digital modes is in use. To avoid this, lock the memory on your radio into the digital mode. Now, you’ll either hear digital audio that your radio understands, or you’ll hear silence. Copyright © 2015-2019 Wayne Technical Fanatics.